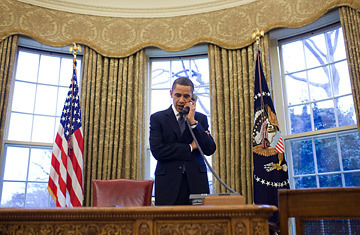 President Barack Obama speaks on the phone with Russian President Dmitri Medvedev about the Strategic Arms Reduction Treaty on March 26, 2010. It is 72 pages long and filled with arcane deterrence language, but there's arguably no more important document in the world right now than the Nuclear Posture Review (NPR) that President Obama released on Tuesday. After all, the text spells out how many nuclear weapons the U.S. will continue to deploy around the world and the conditions under which it would be prepared to use those weapons  no small thing considering that its arsenal is big enough to threaten the survival of the species. Here are five ways in which Obama has shifted  or not shifted  U.S. nuclear policy from the George W. Bush years. In a historic speech in Prague last April, Obama pledged to "end Cold War thinking." Yet the U.S. still has a cache of land- and sea-based missiles and long-range bombers. The reason? The idea of Mutually Assured Destruction (MAD) is still central to America's nuclear standoff with Russia. With thousands of weapons ready to launch at a moment's notice and with both sides retaining the option to "launch on warning" of an incoming attack, Obama said during the presidential campaign that the U.S. was unnecessarily exposing itself to accidental nuclear war, in the event of faulty radar alerts or computer glitches. (Long-range missiles do not have a self-destruct button and cannot be rerouted mid-flight.) While it is highly unlikely that the U.S. and Russia would ever intentionally engage in nuclear war, the NPR does nothing to carry out Obama's pledge to lessen the chance of accidental nuclear war by taking U.S. missiles off hair-trigger alert. The NPR says the U.S. would not threaten to use nuclear weapons against non-nuclear states  as long as they are not seen to be developing nuclear weapons. This is both a carrot and a stick for countries with suspected weapons aspirations such as Iran and Syria, as well as those with confirmed nuclear programs, like North Korea. The carrot? A guarantee of security if they fall in line with the Nuclear Non-Proliferation Treaty (NPT). The stick? The possibility, however remote, of nuclear war if they don't. In an interview before the NPR's release, Obama said that, in a change from the past, the U.S. would no longer threaten nuclear war in retaliation for a biological- or chemical-weapons attack. But look closely at the text, says Hans Kristensen of the Federation of American Scientists, which monitors nuclear weapons policies, and you'll see that's not quite true. For instance, the document states that there "remains a narrow range of contingencies in which U.S. nuclear weapons may still play a role in deterring a conventional, chemical or biological attack against the U.S. or its allies." Says Kristensen: "Basically, there is no restriction on how the U.S. can use its weapons in this document." Last December, Senate Republicans sent a letter to Obama saying they would fight the ratification of arms-control treaties unless the President guaranteed the longevity of aging U.S. nuclear weapons  code for building new nukes. In interviews this week, Administration officials said they would not develop new weapons. But, says Stephen I. Schwartz, a nonproliferation expert at the Monterey Institute of International Studies, that depends on how you define new. The document states that a warhead introduced into the stockpile will not be considered new if it is based on a previously tested  but never deployed  design. "The United States conducted 1,030 nuclear weapons tests from 1946 to 1992," he says. "We developed and deployed 65 warhead types. Another 25 types were tested but canceled before production. Some of those 25 nukes are presumably now available for revival." The NPR keeps in place an ambiguous declaration from the Bush years that the U.S. "will hold fully accountable" any state that "supports or enables" terrorists in their mission to use weapons of mass destruction. That implies that the U.S. would use nuclear weapons against any state that gave a nuclear weapon or weapons-grade material to terrorists. Some nuclear terrorism experts  most noticeably Graham Allison of Harvard University  had hoped the U.S. would go further and threaten nuclear war against any nation from which terrorists had obtained nuclear material  even if it was stolen. This, Allison said, would give urgency to the task of securing weapons and weapons-grade material. But there are obvious problems with that. Would the U.S. really bomb Russia if terrorists stole material from a factory there? With a nuclear security summit planned for next week in Washington aimed at reaching international agreement on efforts to secure vulnerable fissile materials, Obama obviously felt it more sensible to focus on intentional transfers rather than the potential for stolen weapons. Yes, that's right. The mighty Belgian air force is nuclear-armed. Although none of the four countries have their own nuclear weapons, there are an estimated 200 B-61 thermonuclear-gravity bombs scattered across their land. And under a NATO agreement that was struck during the Cold War, the bombs, which are owned by the U.S., can be transferred to the control of a host nation's air force in times of conflict. The NPR declares that these weapons "contribute to Alliance cohesion and provide reassurance to allies." Again, that's arguable: a 2006 poll found that almost 70% of people in the four countries want the U.S. nukes withdrawn, and many non-nuclear states say the weapons violate a clause in the NPT that prevents nuclear powers from arming allies. But while retention of "nuclear-burden sharing" may cause Obama problems internationally, it is part of a raft of compromises in the review meant to appease critics in the Senate, who may be needed to ratify international arms-control treaties, according to George Perkovich, director of the Nuclear Policy Program at the Carnegie Endowment for International Peace. "Senate ratification is required to take even some of the earliest, easiest steps on the long road toward global nuclear disarmament," he says. "Obama could have offered a righteous posture review  but then had nothing concrete to show for it in terms of actual treaties."